The cafe had a stellar record, was beloved by court personnel and had always paid the rent on time. 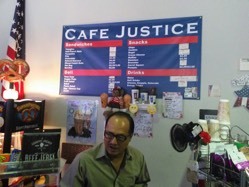 Cafe Justice is a popular gathering spot for plaintiffs, defendants and staffers looking for a respite from the stress of the day. The walls of the cafe are decorated with inspirational Christian messages and their music playlist includes several contemporary Christian songs. Last October, the cafe’s religious music and inspirational decor triggered micro-aggressions among local atheists. A complaint was filed with the San Bernardino County Department of Real Estate Services, the cafe’s landlord. A few weeks later, the Magnos were notified that their location was going to be put up for public bid status. "We were encouraged to include in our proposal for bid, that we would not play our religious music or have any religious decorations," Mr. Magno told me. "Every day we open our cafe—our endeavor is to be able to not just serve the best products that we can, but also encourage people who might be going through a rough time," he told me. As it stands, the Magnos are about to be evicted from the courthouse. Should that happen it would be a grave injustice for Cafe Justice.